Due to state budgetary constraints, Camp Harkness may be closed. While I understand that this affects relative few, it would be crushing to us. And many other special needs families. Just awful. Please sign this petition if you want to keep me and my family sane. Thank you! I wrote this several years ago, but we continue to make the trek to Waterford throughout the summer. I ended this page with “we’ll always have a go-to beach every summer for the rest of our lives.” Let’s keep it that way. Everyone’s always asking me what my favorite [insert anything I ever write about] is. I pretty much never answer because quite frankly, I don’t have an answer for them. But when it comes to “what’s your favorite Connecticut State park,” I now have an answer. And with probably a hundred state parks yet to visit, I’m confident my answer won’t change as long as Camp Harkness stays open. What’s that? You’ve never heard of it? (Truthfully, I’m still not sure if this place is even an official state park, but I’m pretty sure it is.) Regardless, this place is certainly unique. Camp Harkness was originally part of the neighboring Harkness Estate, now Harkness Memorial State Park. 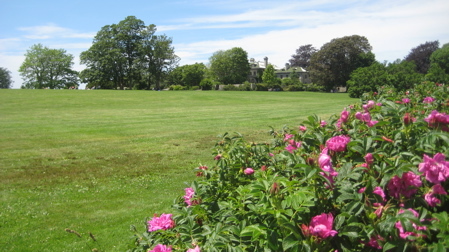 The estate served as the summer residence of the Harkness family, where philanthropist Mary Harkness often hosted children with polio during the summer season. Through her will, Mary Harkness in 1952 deeded the portion now known as Camp Harkness to the State of Connecticut for perpetual use by those stricken with polio, “handicaps”, and veterans. Originally operated as a state park by the CT Department of Environmental Protection (DEP), the Camp was turned over to the CT Department of Developmental Services (formerly the CT Department of Mental Retardation) in 1977. The property is managed by the South Region of DDS. And most of you can’t get in to enjoy the place. But we can! “Thanks” to Damian’s state-confirmed developmental disability that will remain with him for life. (That’s the criteria one must fulfill to get the special pass for entry. And yes, duh, families are invited as well.) The place is really cool, but trust me, you’re okay for not getting to go there. 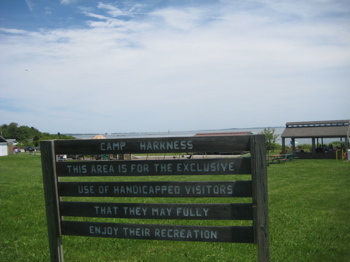 I’ve read in a couple places that Camp Harkness is one of only three or four state parks dedicated to those with special needs in the country. So that’s pretty cool. And for whatever reason, the state and the Department of Developmental Services keeps this place pretty hush-hush. Which puts me in a weird place: I want to shout from the hilltops about how great Camp Harkness is, but I kind of like the solitude we find there. Totally selfish of me, I know, but I deserve that every now and then. For us, the best part of the park is the beach. 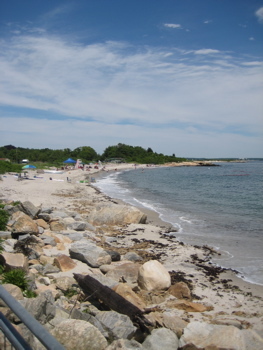 Situated right next to Harkness Memorial State Park (and somewhat securely fenced off from it with sign explaining to those on the other side what Camp Harkness is all about), the small but soft and sandy beach provides calm and shallow water with two breakwaters. It’s perfect for the kids (and adults) who come here and sort of require that. There is a large natural rock outcropping on the eastern end of the beach from which we can see Waterford’s town beach and also Ocean Beach State Park. Pshaw on them and their crowds and long walks to the sand. 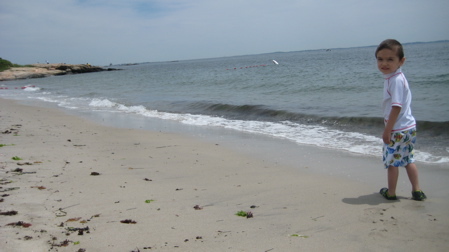 Perhaps the best part of the Camp Harkness Beach (for us) is the absolute freedom to be us. Damian can be Damian to his heart’s content. He can pitch a violent self-injurious fit and no one will think we’re terrible parents. He can yell his crazy yells and no one bats an eyelash. Actually no, the best part is the other kids. Since families are there, there are a bunch of typical siblings of special needs kids who don’t mind that Damian doesn’t talk or that he’s a little different. Two wonderful little girls immediately befriended Damian and got him to play with them. Age-peer play! A breakthrough! 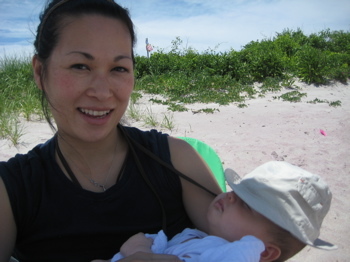 At one point, while playing with sand and a bucket, Damian even told me to go away. This may sound odd, but to me, that was a great thing. She even held his hand and took him into the water past his knees – at which point he began happy/angry yelling/laughing and looking for me. He had a blast. They’ve begun a program here with horses too, since that’s becoming all the rage. For now, we were just able to look at the horses from afar. Camp Harkness is beautiful, well-kept and really just a great place and state program. Now let’s hope the threatened state layoffs don’t affect it and we’ll always have a go-to beach every summer for the rest of our lives. Looks like a very sweet spot. Happy summer! Confused on how can it be for the Handicapped only, when the deed says veterans too! If I remember correctly from my tour of Eolia, when Mrs. Harkness set up the camp it WAS for veterans and the war-injured and stuff. But when something changed with the state took ownership of it, making it what it is today. I’m sure someone from the Friends of Harkness would better be able to answer your question. I’m not sure what this comment means. I’m guessing Patty is confusing Harkness with Camp Harkness. Not that it really matters. really have enjoyed all you put together on Harkness. Love the photos and memories they bring back. May you live a long healthy life with many days of enjoying the beauty there. My aunt Olga enjoyed when she went to Camp Harkness with her handicapped friends. She loved the cookout’s too. I want to thank you for the wonderful care that you give to the people that visit. My aunt Olga passed away 2/27/12 at the age of 93 years old. Her caseworker’s and social worker’s had a memorial stone dedicated for her. 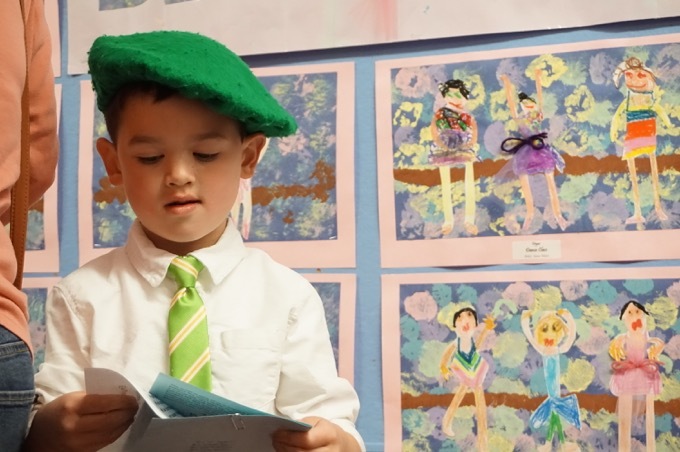 At Camp Harkness was a very special time for Olga and her friends. 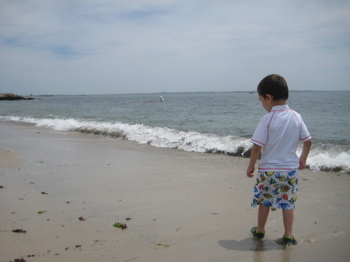 I have been to Camp Harkness camping, swimming, visiting the nearby mansion, and just to see the beach and shore. It is very nice, I now live closer and plan to get there soon again. I am going to a daytrip and stop in soon. Reading about the development of Seaside land. Will be Camp Harkness be safe and remain in operation? I have came to the Camp beach several times this summer. We found out about it when our daughter was in her early 20’s. We love it and go often. Called on Friday to reserve and was told that they cannot do any reservations as the Camp may be closing due to the Governor’s budget cuts. So how much money is needed to maintain the place? I understand that the land could be worth money, but upkeep wise it is a small section of a beach. I bet that governer sells it to a brother in law or someone who made a large donation to his campaign. So the real question is, how much does the park cost to operate, and can we turn that into a volunteer type of service? Surely one can get family members that you mention to volunteer their time for free to maintain whatever it is that needs maintained. That’s the problem with this current government. They don’t look for a fix, they just look to see what they can cut that no one will notice. It is time that we fixed connecticut, by encouraging people to volunteer time, instead of stealing the money from our pockets. The information above is not entirely correct. The Mansion was the summer home to the Harkness family. Mr. Harkness was an oil tycoon and philanthropist. His wife started building cottages on the property to give a respite to those suffering from polio. It is a Disabled only State Park as when she passed she donated it to the State. It is not and never was for Veterans, however, if the veterans have a disability they may go there. Each disabled individual can bring up to 5 family members. As an Advocate in this State I mention it to anyone with a disability. 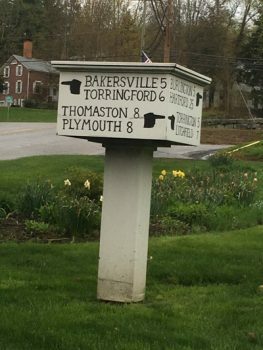 I’m pretty sure in order to stay at any of the cottages you must be a Connecticut resident! Also the cottages are only available after the second week of August as they are occupied by group homes until then. It truly is a beautiful place. I worked at Harkness Memorial State Park for four summer years while in college 1957 thru 1961. We did maintenance work both at the public park and the Handicap section of the park. It was truly a life changing experience to see the joy that the handicap participants experienced. While there the water color paintings of Rex Brashers collection was displayed in the mansion to be enjoyed by the general public. I am told that this collection is now elsewhere which I consider tragic.